At long last, we’ve come to the end of this captivating culinary journey. And what a better way to end this best-of list than with the last dish that wowed me in 2010: One Market’s Dungeness Crab Salad. What I love about One Market is how the menu reads fairly plain: Hand-picked Dungeness Crab, fuyu persimmon, pomegranate, hearts of palm. At first glance, there’s not much about this description that’s particularly exciting, but what’s placed in front of you is nothing short of a beautifully presented, technically advanced dish indicative of a one star Michelin-rated restaurant. It’s a classic shock and awe maneuver, and it works. With crab popping up on winter menus all over the city, this particular dish was crab at its finest. Chef Dommen uses ingredients that enhance and compliment the distinctive flavor of the crab, allowing it to shine rather than overpowering its delicate, sweet taste. And, while the use of fuyu persimmon and pomegranate (prepared as a gelée) captured the essence of the season, the fresh, light, clean flavors juxtaposed the heavy, hearty, earthy preparations traditionally found on winter menus. It was like a bite of sunshine and crisp, fresh air. And who doesn’t like bites of sunshine? To read more about my experiences at this restaurant, check out my write-up of One Market. 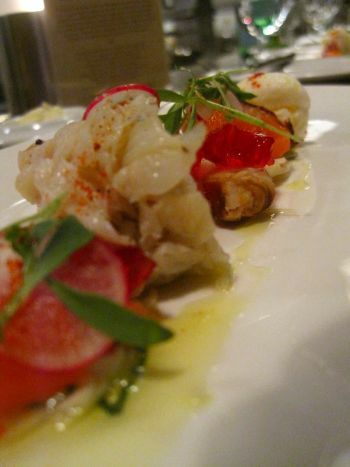 On my next client lunch at The City, I'll be at One Market having Dungeness Crab Salad. Get to 10! Awesome! It's such a good spot for a client lunch cause it's not just serving steaks and giving off a business-men-in-suits atmosphere, the food is actually incredibly good. If any of your clients care about food, they'll be impressed. Try the mi-cuit tasmanian trout as well, it's one of their signatures and incredibly good. And any order of fish will be exceptional cause Chef Dommen worked the fish station at Lespinasse, so he really knows what he's doing.